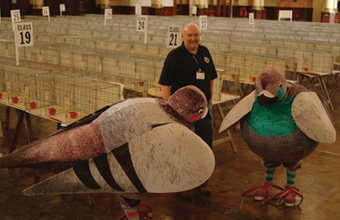 GIANT performing pigeons joined more than 20,000 people to welcome the Royal Pigeon Racing Association's annual show to Blackpool. This is the 22nd year the RPRA has brought their Homing World Show of the Year to the popular holiday resort. And as more than 20,000 fanciers gathered at Blackpool Winter Gardens, two giant pigeons were on hand to provide entertainment. RPRA general manager Stewart Wardrop said: "This is a massive event in our calendar and it always proves to be hugely popular. Not only have you got the attraction of so many pigeons and fanciers in one place but it also gives our members the opportunity to enjoy a weekend away. "Blackpool is the perfect host which is why we continue to come year after year. "The giant pigeons add a fun element to the event and we are delighted they were able to entertain not just fanciers, but the residents and other visitors to Blackpool too."